The DC30 is a PWM regenerative (four quadrant) drive, meaning it can reverse and/or brake on the fly without bulky contactors and resistors. The drives put regenerated power from the motor back to the battery supply, thus extending battery life. These drives have calibration capabilities of Motor Current Limit, Regen Current Limit, Accel, Decel, IR Comp, Min Speed, Forward Max Speed, and Reverse Max Speed. The DC30 is a microprocessor based drive like all of our new low voltage controls. Our microprocessor based drives are very OEM friendly. Many of our customers have eliminated the need for a PLC and /or sensors in their system by utilizing the flexible I/O of the DC30. Minarik Drives caters to OEMs who need something tweaked or modified, unlike the other major low voltage drive manufacturers. Contact Minarik Drives with your custom needs and ideas. *Peak time of one minute. Low Voltage motor operation: Designed for 12 and 24 VDC motors. 4Q reversing: Regenerative/ 4 Quadrant drives have the ability to perform quick and contactorless braking and/or reversing on the fly! Speed range, regulation, & form factor: 1% of base speed regulation with 100:1 speed range and a 1.01 form factor over the entire range. User adjustable calibration: Minimum Speed, Forward Maximum Speed, Reverse Maximum Speed, Motor Current Limit, Regen Current Limit, Acceleration, Deceleration, IR Comp. Diagnostic LEDs: Power, current limit, over voltage, under voltage, and overheat foldback. Brake Output: Applies a voltage out to a brake coil when the drive is disabled or stopped. Stopping modes: Brake or coast to a stop. Microprocessor based: Allows for special calibration ranges or custom I/O for OEMs. -L Option: Allows the drive to work with actuators containing a linear pot. 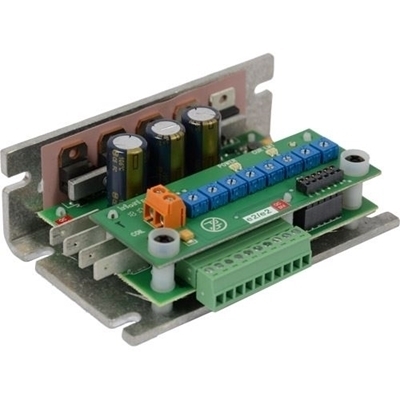 -W Option: Allows for bidirectional control with a unidirectional signal. High Efficiency: Outputs up to 95% of the input voltage. Ideal for battery powered equipment: Maintains both set and/or variable speed even as battery coltage declines. Extends total running time of equipment. RoHS: All DC30-12/24-4Q series models are RoHS compliant.